The Agricultural Campus grounds staff have joined forces with the Friends of the Gardens to create a butterfly meadow on campus. The half acre site, located South and Southwest of the Haley Institute, will be managed for the creation of butterfly habitat. The existing turf will be allowed to grow naturally long, and the wildflowers already present in the lawn will be encouraged. 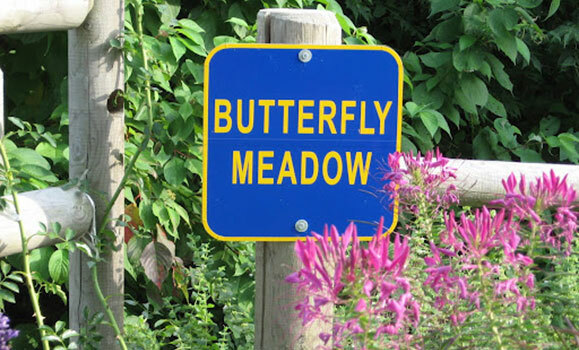 Additional perennial flowers and shrubs (which provide the nectar and foliage needed by the butterflies and their larvae) will be added into the meadow. Mown paths are already in place to allow nature watchers to wander through the meadow. An interpretation board with information on local butterfly species will be added in future, and will include a recording site for enthusiasts to note their observations. "The opportunity for research associated with this new garden is very exciting - little work has actually been done on native butterflies" said Bernard Jackson, an internationally known butterfly expert who recently published a book on butterflies and butterfly gardening. "There is little documentation on what plants they prefer for feeding or colour attraction. There's a great deal we can learn here." The butterfly meadow will not only provide an attraction and research opportunity, it will demonstrate what is possible in urban fringe gardens for wildlife. With the trend towards ecological consideration in urban development, the meadow could prove to be a useful model for industrial park or school ground landscapes. "This is exactly what we talk to Environmental Horticulture students about" confirmed Carol Goodwin, Faculty of Agriculture, Environmental Sciences department. "Providing for wildlife doesn't always involve large tracts of land - the average homeowner can make a real difference". A number of native plants important for our butterfly species have been added to the meadow, including Queen Anne’s lace, yarrow, asters, goldenrod and clovers. Exotic species, including Buddleia, Lilac, Monarda, Nepeta, and Evening Primrose have been introduced into the meadow for larval and adult food sources. Stones are placed to provide sunning sites. A walk through the meadow is exciting on a warm summer day. The range of meadow flora attracts a number of species, and larva can be seen feeding on their host plants. Host plants are grown relatively close to the paths to provide easy viewing of the ‘not so pretty’ life stage. As the plants grow and expand, we hope to see even more activity of both butterflies and those who love to watch them. Leave your net at home, and come for a walk!